Alright, I’m simply assuming that you’ve read my review of Ys I and are familiar with the general concept and art style of the game. Ys I & and Ys II were originally intended as a single game but the creators decided to split them up in the end. So if you did not complete Ys I chances are that the story of Ys II probably is too confusing for you since it starts right after the end of the first game. I think it’s a good thing that they’ve decided to split the game into two parts. You can really tell that they have learnt from their mistakes with Ys I.
They’ve tweaked their core combat mechanic. You still hit enemies by simply running into them but now you have to hit them from the side if you don’t want to be hit by them as well. Attacking them off-center simply isn’t enough any more. You will also learn a few magic spells later on which add some variety to the rather simple combat system. One of those spells shoots a fireball and costs little to no mana. So in the end I ended up using the fire spell more than the usual bump attack and I really liked that the game allows you to find your personal play style. Ys II is more linear than Ys I. It’s up to you to decide if that is a good thing but I personally liked it. 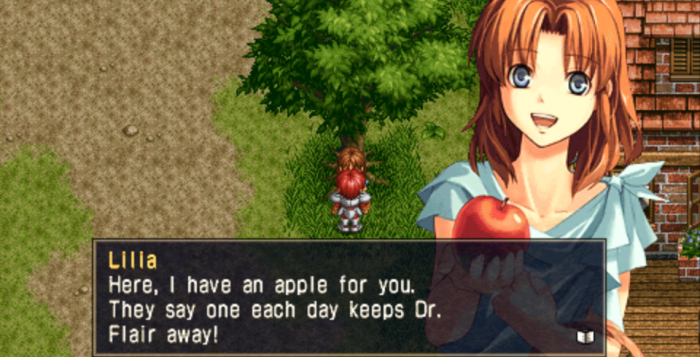 Especially after running around like a headless chicken in Ys I really welcomed Ys II linearity. They also tweaked their leveling mechanic and the difficulty. Once more I masochistically decided to play the game on the nightmare difficulty. But this time the game actually wasn’t unfair but challenging. The first boss almost felt like a bullet hell and I already feared that I’d get stuck trying to beat the bosses in Ys II as well. But that was not the case. Whenever I struggled with beating a boss or certain enemy I simply could grind and level up until I felt strong enough. This was not possible in Ys I since you could only reach level 10 and then you simply stopped leveling. I reached level 53 in Ys II and that was enough to easily beat the last boss. The max level is 55 so I still could have grinded a bit more. So Ys II feels a lot more balanced than Ys I and I’d say that it’s the better game. The only thing I’ve liked more in Ys I was the music. It’s still great in Ys II but I somehow did not enjoy it as much. A must buy for every action-adventure RPG fan!